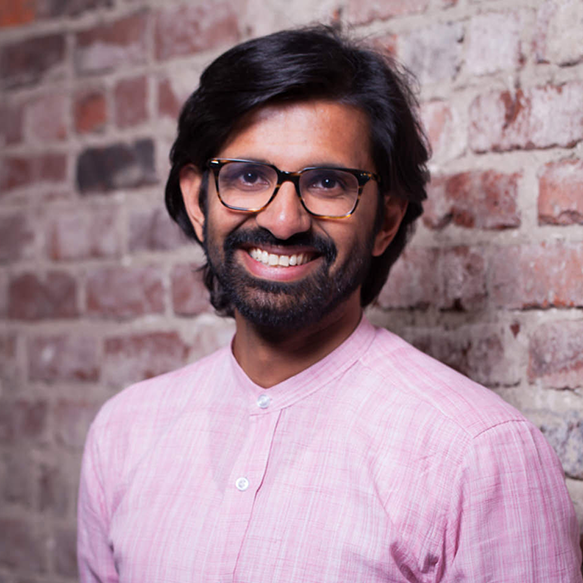 Mohit Bhoite works as a senior hardware engineer at Particle, where he designs and builds their flagship IoT products. He is also an avid maker who dedicates his personal time to building free-formed electronic sculptures primarily out of brass. These sculptures are an artistic exploration into a world where circuits are freed from their two dimensional constraints and brought into a three dimensional environment. The circuit paths become the body of the sculpture where their form follows the function. He combines his background in electronics and robotics to create static and kinematic sculptures that convey information fetched over the internet through sound, light, and motion. These sculptures sometimes take on an anthropomorphic form thereby leading the viewer to attach personalities and emotions to them. The inspiration for his work is drawn from a wide variety of sources which include BEAM robotics, Japanese carpentry, truss bridges, industrial plumbing, Islamic patterns, and the works of Mark Tilden and Peter Vogel. Mohit holds a master’s degree in Robotics from the University of Pennsylvania. He spent his time there as a research assistant at the ModLab helping build the next generation of modular robotics. For his master's thesis he researched on rapid robot prototyping using binary foams. Prior to this, he worked at a startup in Mumbai, India, developing robotic kits and conducting STEM focused workshops for high school and university students all across the country. Join Mohit to hear about building free-formed circuit sculptures, and how anyone with the right tools can get involved in this art form. He'll explore ways make these sculptures interact with the environment around them or with the user.